Our Miranda Collection demonstrates an emphasis on design individuality while also addressing whole room environments through an eclectic lifestyle approach. Through the use of unique materials, elegant finishes, and a sophisticated neutral palette, this collection offers distinctive pieces for every room of the home that are creative and beautiful while retaining a refined cohesion. 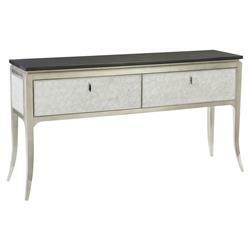 Other worldly chic, this superb sideboard displays a luxurious, modern take on a classic silhouette. Featuring a top finished in sultry, midnight maple, the sideboard is supported by silver leafed legs capped with lustrous chrome ferrules. Two drawers fronted in a luminous, silver capiz shell provide added function and flair.